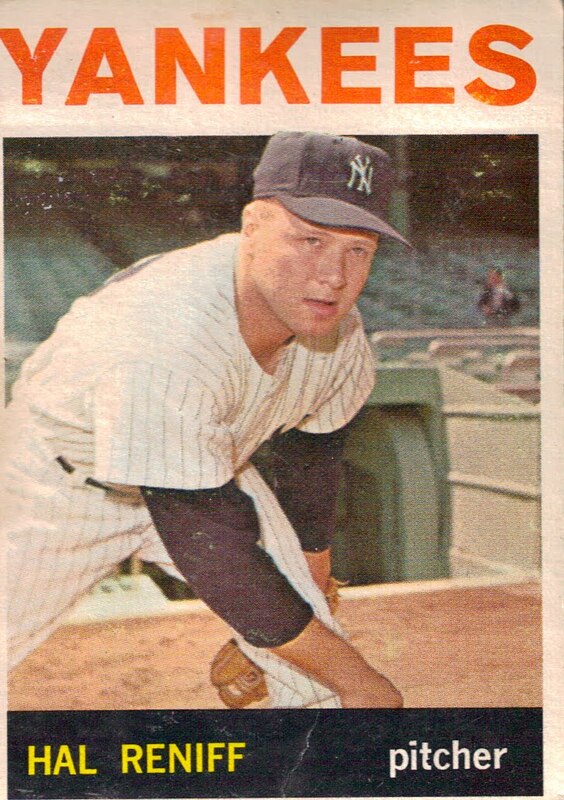 Hal Reniff was a true reliever for the Yankees and Mets from 1961-1967. Let’s just say being a true reliever during that era wasn’t a high regard for a pitcher. He recorded a team-high 18 saves with a 2.62 ERA for the Yankees in 1963 and finished with a career record of 21-23. He played his final 29 games in 1967 with the Mets after struggling with the Yankees early in the season. He pitched in the 1963 and 1964 World Series, allowing no runs over 3 1/3 innings, but the team lost to the Dodgers and Cardinals. As expected, much talk has surrounded the Hughes Rules today because Phil Hughes is making his first start tonight on extended rest. On June 24, 1990, at age 23, Mr. Harkey threw 160 pitches in a game after throwing 128 in his previous start. He went on to pitch on short rest repeatedly as the Cubs went to a four-man rotation that summer. Finally, in early September, he suffered a season-ending shoulder injury, and he was never the same pitcher again. My pitching theory: If a pitcher looks like he’s losing his control and he’s starting to get hit hard, it’s time to make a call to the pen. Obviously, if it’s the beginning of the year or if the pitcher is prone to injuries, you have to factor that into the decision as well. Also, never trust pitchers that want to stay in. They always want to clean up their own messes. If you don’t believe me, ask Grady Little. I’ve always believed the 100-pitch “maximum” set by most managers is ridiculous because high school and college pitchers exceed that limit and pro hurlers used to exceed that limit regularly. Ex-Japan Pacific League hurler and current Red Sox starter Daisuke Matsuzaka famously threw a 250-pitch game the day after throwing a 148-pitch shutout in high school. My own teammate in high school averaged 150 pitches per start and once threw 200 in a 10-inning game. I wonder how Walter Johnson was able to throw almost 1,500 innings in a four-year span. Harkey’s workload wasn’t extreme for his time, yet injuries plagued his whole career. Some pitchers are more fragile than others. As for Hughes, I support the Hughes Rules because of his recent history of injuries and they’re not nearly as extreme as the Joba Rules were last year. The Yankees kick off a three-game set with the last-placed Seattle Mariners tonight, but the M’s aren’t playing like a 31-44 team lately. They won two of their last three series in interleague play and their pitching has continued to be phenomenal to lead them to a 7-3 record in their last 10 games. In that span, their pitching staff has allowed 21 runs (I think you can do the math). But in that stretch they haven’t faced an offense of the Yankees’ caliber. New York ranks first in OBP, second in runs and fourth in slugging percentage and batting average. They have no history yet this year, but in the previous two years the Yankees have won 13 out of 19 meetings. Mariners: Ichiro Suzuki. The only .300 hitter on the team, and always an exciting player to watch. He is a career .327/.374/.432 hitter against the Yankees. Yankees: Brett Gardner. Again, he’s having an excellent June and, like Ichrio, he’s got motorized wheels for legs. Keep an eye on his spot in the batting order too. Thursday looks like a lock victory for the Yanks based on the pitching matchups, but tonight and tomorrow will be major challenges. It’s all a question of whether or not the Mariners can give their aces any run support. I’ll give the nod to the M’s this week: they’ll take two out of three. The majority of voters either didn’t know what I meant by realignment or didn’t believe realignment should ever occur in baseball. For those who don’t know what it means, realignment refers to the rearranging of the divisions in baseball, like moving the Red Sox to the AL West. Some even think it’s time to return to the old way of doing it with just two leagues and no divisions (top 4 make the playoffs). I actually wouldn’t mind that way of doing it — scrapping the divisions. It would make up for the situation that baseball has today with three of the best teams in one division but only two of them can possibly make the playoffs. News broke yesterday that Dave Eiland finally will make his return to the Yankees Tuesday, which leads me to my next poll. Poll: Will Eiland’s return cure Burnett’s pitching sickness? The Yankees trailed 6-2 heading into the ninth inning, but scored four runs off closer Jonathan Broxton to tie it. Then Robinson Cano cranked a two-run homer to left-center off lefty George Sherrill in the top of the 10th and Mariano Rivera completed his second inning of work to give the Yankees an 8-6 win. Best of All: What a comeback win it was. They were down by as many as five runs but beat a normally good bullpen to take the series. Alex Rodriguez hit a two-run homer in the sixth to break up Clayton Kershaw’s shutout. Derek Jeter had three hits and got on base four out of five times. Worst of All: Brett Gardner left the game after being hit by a pitch in his first at-bat and is considered day-to-day. Coming Up: The Yankees are off Monday before facing the Mariners and Blue Jays at home this week. One more week on the west coast road trip after that and we’ve hit the All-Star break! Like always, the season always seems to fly by. The Dodgers took advantage of A.J. Burnett early, making for one of the longest, unexciting games of the year. The Dodgers won easily, 9-4, and Burnett was almost unbearable to watch. Best of All: Mark Teixeira’s three-run homer in the first inning. It was the only positive moment of the game from the Yankees’ standpoint. His 13th of the year. Worst of All: Burnett allowed six earned over three innings on six walks and six hits; he’s been the exact opposite of CC Sabathia in June. He’s 0-4 with a 10.35 ERA. Burnett doesn’t consider pitching coach Dave Eiland’s absence an excuse, but I do. Derek Jeter K’d three times on his birthday. He turned 36, by the way. But he did single, steal a base and score in the first inning. Coming Up: Sunday night’s game should be a dandy now, right? Entourage cast hangs with Yanks in L.A.
Entourage just might be my favorite TV show. After all, it is the only show I watch that’s still producing new episodes (which excludes Friends and Seinfeld). When Entourage gets mixed with the Yankees, you get a big smile on my face. Season 7 of Entourage premiers Sunday night on HBO and I’ll be watching. If you need to get caught up with old episodes, just head to SideReel. If you’re on Twitter, follow me @lenNYsYankees for Yankees updates and Entourage commentary. Joe Torre met up with the core four before the game as planned, but Alex Rodriguez “didn’t see him,” supposedly. But I’m sure Torre saw him when A-Rod cranked the game-winning homer in the sixth to give the Yankees a 2-1 win — all while I was out bowling with my EIC team. Best of All: CC Sabathia: W, 8 IP, 4 H, ER, 3 BB, 7 K. He’s now 5-0 with a 2.19 ERA in June. Can you say, AL Pitcher of the Month? A-Rod also had a double and scored on Jorge Posada’s single in the second. Worst of All: The bottom four combined to go 0-for-12, which includes Brett Gardner, who is red hot in June, and CC, who is one of the top hitting pitchers. Coming Up: The Yankees can clinch another series win when they play tonight (a little earlier for us east coasters). Below are my chosen players deserving of a selection to this year’s All-Star Game for both the American and National League. Obviously, all these players won’t be voted in by the fans because the Midsummer Classic is a popularity contest. And, obviously I’ll be voting all Yankees when I fill out my real ballot 25 times on MLB.com. Feel free to argue anyone that should or should not be on this list. Keep in mind both rosters will have 21 position players and 13 pitchers. Remember, this list is who I think belongs based on their statistical performance in 2010 — not their 10 previous All-Star selections. The Yankees promoted ‘07 first-round pick Andrew Brackman to Double-A Trenton today. This is huge news for Yankees fans, even though it was expected, because of his resurgence. Brackman was downright awful in 2009 with the Charleston Riverdogs, going 2-12 with a 5.91 ERA while battling injuries. This year, the 6-foot-10 tower from North Carolina State strung together seven starts with a 2.05 ERA to earn himself the promotion. But perhaps more importantly, he’s showed huge improvement in command with his SO/BB ratio. There you have it. Brackman will enter the Hall of Fame in 2039. Mark Teixeira Tex A.J. Burnett A.J. After forcing extras with a run in the ninth, Curtis Granderson homered to open the 10th and give the Yankees a 6-5 win along with the series win. Best of All: Mariano Rivera’s first two-inning save of the year. He had us all thinking back to 2001 when he loaded the bases with nobody out, but then a couple of pop ups and a strikeout later the game was over. Mo also collected his fourth career trip to the plate. Sadly, he failed to get his first hit, grounding out to first. Granderson’s homer was his third hit of the day, as he fell a triple shy of the cycle. Something tells me this guy will hit for the cycle one day. Here’s a rare line for you: 0-for-4, 3 runs scored. That would be Derek Jeter, who walked twice and reached on a fielder’s choice. Worst of All: Javier Vazquez’s start wasn’t very memorable. Five innings, four earned runs on six hits and two walks. Only one K for a strikeout pitcher. Not terrible, but poor for a guy who has pitched well of late. Coming Up: The Yankees get a day off today before facing the Dodgers over the weekend for what should be a huge media-hyped weekend. And maybe Georgey will make a pinch-hit appearance! I almost forgot: Mikey and Johnny are on the call. Colin Curtis went unmentioned in my game recap because I felt he deserved a separate post. Yet another Yankee made his debut Monday, and it only took two at-bats for another ball to get thrown into the dugout for safe keeping. In Curtis’s second at-bat, first last night, he cranked a two-run double over the center fielder’s head. Yes, his parents and brother were in attendance. Yes, Curtis’s face was lit up like the fourth of July. Yes, it was an awesome moment to watch. And yes, I’m glad I stayed up for it. He tipped his cap to his parents on his way back to the dugout, where he seemed very comfortable with the rest of the Yankees. He chatted it up with Phil Hughes, as the two played with each other for two different minor league teams in 2007. Curtis was called up Monday, taking the place of Chad Moeller. Curtis flied out to center in his first chance on Monday. Pete Mikkelson and Bob Meyer are both labeled star rookies in this card. However, neither turned out to be stars — or last long with the Yankees. 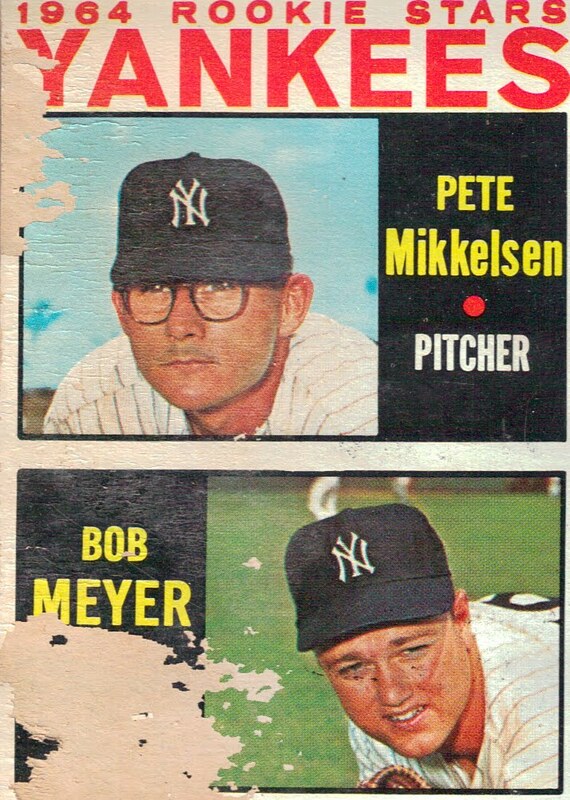 The Yankees let go of Meyer 18 1/3 innings through the 1964 season, allowing the Angels to purchase his contract. He had a 4.91 ERA with the Yankees and a 4.38 career ERA. Mikkelson had a fairly good rookie campaign, going 7-4 with a 3.56 ERA strictly as a reliever. He started three games with the Yankees in 1965, but those were the only starts of his nine-year career. The Yankees traded him in the offseason that year for Pirates’ longtime hurler Bob Friend. Alex Rodriguez is by far the most hated Yankee today. Whether it’s his loaded contract, his admitted use of steroids or his “dirty” way of playing his sport at times, non-Yankees fans tend to dislike A-Rod the most. As it turns out, he’s still the most hated Yankee, but he’s made some progress. This year’s Top 10 of Forbes’ Most Disliked People in Sports for 2010 ranked A-Rod the eighth most disliked. Last year, he ranked third. Clearly, his stealthy approach with the media has helped decrease the hate level. No more interviews with Peter Gammons. No more Kate Hudson Perez Hilton reports. He’s proven fans right that he can avoid media distractions in 2010. Unfortunately for him, I think that the latest numbers will rise if he continues to have a sub-par season. When you make as much money as he does, underperforming gets magnified even more. The Diamondbacks rocked A.J. Burnett in the first inning for five runs on three homers to put the game away early. They went on to win 10-4, as 22-year-old Justin Upton led the way with a 3-for-3 day including two homers, four RBIs and four runs scored. Best of All: Brett Gardner had a huge day in the No. 8 spot, going 4-for-4 with a stolen base. He scored twice, but didn’t drive in any runners. Chad Gaudin had a nice day in relief: 2 IP, H, 0 R, BB, K.
Worst of All: Burnett was atrocious: 4 IP, 9 H, 7 ER, 2 BB, 4 K. Burnett’s 6-6 with a 4.83 ERA. Chan Ho Park allowed Upton’s second homer dampening his line to 2 IP, 3 H, 3 ER, 3 K.
Coming Up: The Yankees will look to get out in front early tomorrow at 9:40 p.m.
Mariano Rivera has retired 21 straight hitters and allowed one hit in his last 11 innings pitched. He’s 40 years old and nobody notices. Luis Gonzalez retired two years ago. Repeat after me: Byung-Hyun Kim. Byung-Hyun Kim. The Yankees have played the Diamondbacks nine times since the infamous 2001 World Series and the Yankees have won seven of them. The last three came in 2007 with a sweep in the Bronx. Yankees: Mark Teixeira. He has hit two homers in the last two days. Maybe he finally is breaking out of his season-long slump for real this time. Diamondbacks: Dan Haren. He’s an elite pitcher having a bad year. Something says he will value a start like Tuesday’s against the Yankees. Let’s hope the Yankees are riding a five-game winning streak into the weekend series against the Dodgers, because that would mean the Yankees swept this team with ease. Who is ready to stay up late this week and watch these games?